You are what you eat….Duh! We have all heard it time and time again… Do you want to be a McDonald’s chicken nugget or a banana? Not that either of those sounds very attractive, it is common knowledge that what you put into your body is going to have a direct impact on how your body looks and feels. If you consume foods that are cooked in grease, filled with fat, and loaded with sugar, your body is going to reflect that in it’s size, texture, and shape. In contrast, if you eat foods that are high in nutritional value and are void of all artifically added fats and sugars, then your body and skin are going to respond by looking and feeling healthier. 1. Water -If you have been in our office lately you will notice our very fancy “spa water”…Everyday it is a new flavor and it is AMAZING! Erica says, you are welcome! The more you drink, the more you flush all the other bad stuff out of your body and the healthier your skin is going to appear. Adequate hydration from drinking lots of water can prevent the skin from becoming overly dry thereby maintaining it’s youthful, plump appearance. 2. 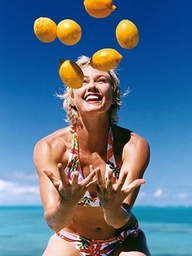 Citrus – These fruits are filled with the powerful antioxidant Vitamin C, which helps guard against the sun’s UVA rays. UVA rays are the “aging” rays of the sun, directly responsible for collagen breakdown in the skin. Oranges, grapefruits, limes, and lemons…. in your vodka, lemon on your skin. Good all the way around! 3. Berries – Another antioxidant-rich group of fruits that also happen to be very low in sugar. They’re easy to eat alone or mix them into cereal, smoothies, and any other dish for a sweet, healthy boost. Berries include strawberries, blackberries, blueberries, and raspberries. 4. Broccoli – This veggie is full of Vitamin A, which is a vitamin responsible for improving the turnover of skin cells. That means when you eat broccoli, your skin gets renewed faster and the newer, fresher skin cells end up on top where everyone can see them. Hence, the healthy “glow” we all love and want! 5. Spinach – We have all seen how hot Popeye has looked for years and years…I have been convinced since 5 that spinach is the way to go. 6. Omega 3 Fish Dishes – If you haven’t had the smoked salmon at Houston’s or the cedar planked Salmon at Boscos in midtown, first of all you are missing out, second, they are really really healthy! Nix out the mashed potatoes! Omega 3 Fatty Acids are considered “good” fats. They can aid in warding off inflammation in the skin. Omega 3’s can be found in tuna, salmon, sardines, and shellfish. 7. Flax Seeds – Another source of Omega 3 Fatty Acids. Sprinkle those little suckers on your food. You will never even know that they are there! 9. Carrots – Another great source of Vitamin A, and a great alternative to leafy green veggies. They like really easy too, buy the little travel packs and DON’T dip them in ranch!! 10. Eggs – They’re packed with iron and protein. Iron can be responsible for the skin’s “glow” and a lack of it can cause the skin to look extremely pale and increase the appearance of dark circles. It’s just no longer about “skinny” It’s about HEALTHY! Word to the wise: wrinkles are inevitable (sorry ladies, I only speak the truth). Whether we like it or not, they are a part of life. Needless to say, there are many simple tricks you can work into your everyday routine to keep them at bay. Don’t be a straw dog. Try not to use straws (and definitely do not smoke). Pursing your lips constantly will cause micro lines to become serious crevices. No thank you. Sleep smart. Believe it or not, there is a right way and a wrong way to sleep (in terms of positioning at least). The wrong way: sleeping on your face or side. The right way: sleeping on your back (even the American Academy of Dermatology recommends this). Slather the SPF. No surprises here: SPF is a must if you want smooth, youthful looking skin. While a tan might look good now, don’t forget who you will look like later…this! 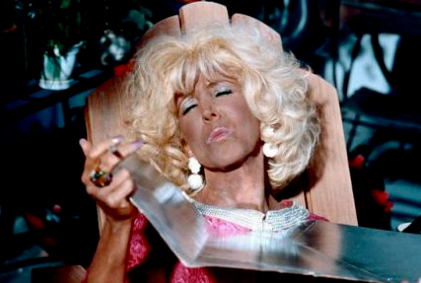 When you buy a sunscreen buy one with Zinc…..OBAGI!! Exfoliate: Prevent cracks and keep your skin soft and supple buy using Retin-A….it is the ONLY thing proven to work. Sleep clean. Always, always wash your face before bed. I cannot stress this enough. Never, ever sleep with makeup on. Take your vitamins. Take a multi-vitamin every day and make sure you’re getting enough omega-3 fatty acids and vitamin E.
Eat right. You are what you eat so be sure to make your diet vibrant and full of color. Do this by consuming plenty of fruits and vegetables everyday. This will keep your skin firm, hydrated and happy. Drink up. You’re only 8 glasses away from happy skin…don’t forget your h2-ohhhs. Smile! While science has yet to prove the direct link between wrinkles and stress, based on my experience the evidence is pretty clear. Stress manifests itself externally (and from what I’ve seen, wrinkles are a common symptom). Take a deep breath, exhale and smile! That said, if you already have wrinkles—wear them proudly! I have little smile wrinkles. Most women my age would freak out, but to be honest, I kind of like them. As Lauren Hutton once said, “We have to be able to grow up. Our wrinkles are our medals of the passage of life.” Couldn’t have said it better myself…but it can’t hurt to make those “medals” a little less obvious before you join the half-century club. Right?